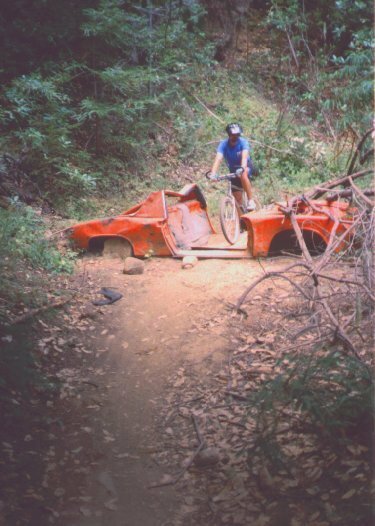 Dave and I went for a ride down the 914 trail at El Corte de Madera (now officially called the Methuselah Trail since MROSD removed the Porsche 914 which used to be there). After it crosses the creek at the bottom of the trail, it connects to a trail called "Giant Salamander". We hung around the creek bottom a while, enjoying the forest ambiance before starting the climb back up, and I half-jokingly asked "Where's the giant salamander?" Half a minute later, Dave said "There it is." And sure enough, an enormous salamander, maybe ten inches long and dark with rust-colored spots, swam out into the creek and started poking its way among the rocks. It seemed much more active than the California Newts we usually see at Montebello, and it had a nice vertically flattened tail -- when it disappeared into crevices it almost looked like an eel. A quick web search suggests that it was a California Giant Salamander. Neither of us was carrying a camera. Oh, well. So I went looking for alternatives, and decided to try PyBlosxom first since it didn't require any changes to the existing entries. It's very nice! Much easier to configure than perl blosxom, plus it comes with (a) CSS template samples and (b) a collection of basic plugins that actually work. Nice! So now I have a sidebar and a category list as well as a calendar, and CSS configuration should be much easier from now on. An article in today's SF Chronicle (no link, they don't seem to have the article online) says Ford is protesting California legislation that would open carpool lanes for hybrid cars that get at least 45 miles per gallon. Ford says this is favoritism toward Toyota, since it excludes Ford's Escape hybrid SUV, rated at 31 mpg. Let me get this straight. Ford thinks the Escape hybrid should be allowed in carpool lanes (with only one driver), while getting worse mileage than most conventional engine Hondas have managed since the eighties ... why? Is having a bigger battery (lead-acid, mind you) somehow easier on the environment than a smaller battery? Or is it that Ford is somehow compelled to produce only humungous inefficient vehicles, and wants to be rewarded for finally making something halfway reasonable even though it's still no better than conventional Japanese cars? Now, I'm no fan of carpool lanes (I think they cause more problems than they solve, even though I mostly benefit from them), but if the environment is part of the argument for them, then base access to them by mileage. The 45 mpg cutoff sounds reasonable, though it should apply regardless of technology used. Honda has made several non-hybrid cars that get better mileage than a Prius. If it can be shown that hybrids are cleaner than conventional cars of similar mpg, that's a different story, but I haven't seen that claim made; most people don't even seem aware of Honda's high-mileage models. And if Ford wants access to carpool lanes, it should drag itself into this millenium and start making efficient cars instead of huge hulking gas guzzlers. Going to Toastmasters today, I decided I'd try taking light rail. There's a light rail station a few blocks from Coherent, where the group meets, and on this end the Children's Discovery Museum station is about 10 minutes away by bicycle. I tried to use VTA's trip planner, but it's hard to use if you're planning a bike trip: the maximum walking distance you can specify is a mile, and it's a lot farther than that to the closest light rail station. The trip planner prefers buses, which adds a lot to the trip time. If you want to use it for bikes on caltrain or light rail, you have to do your own research to figure out the nearest stations, and use those as your source and destination. You can't just use VTA light rail schedules to plan your trip, because while they have a list of expected arrival times at each station, it's not listed in columnar format like most timetables, so there's no way to tell what time the 10:45 train in San Jose is likely to arrive at Tasman. Biking to the station and purchasing a ticket went without a hitch, and a train came by maybe 7 minutes later. The web site said to use the middle door of the car, so I did, but there were no bike storage facilities obvious, so when the train lurched into motion I sat down. Eventually I saw a "Bikes ->" sign, so at the next stop I followed it to the end of the car and found the bike storage area. The way VTA light rail's bike storage works is that there are tracks on the wall of the car, and a hook up near the roof. The hook is way up high and it's offset so you can't stand under it, so I can't just lift the bike straight up like I do when I store my bike on hooks at home. (Maybe really tall people can do that.) There are instructions on the wall that say to get the bike wheels in the tracks, then push on the frame and the seat to walk the bike up the wall, then hang the wheel on the hook. This doesn't work at all; you have to hold on to the front wheel somehow (the handlebars probably work better if you're over six feet all and can reach that high) to keep it from turning, but you have to push against the back of the bike because it's too far in from where you have to stand to be able to hold on to the down tube. Holding on to the seat and top tube doesn't give you enough leverage to swing the bike vertical. I eventually did get my bike hooked, and settled down for the ride, covered in sweat (much more so than I had been from the bike ride) and watching the alarming swaying of the bike, wondering whether it might come off the hook (they're more secure than they look). I exited at Tasman, rather than going to the end of the line (Baypointe) and transferring to the Tasman line to get closer to Coherent. I was running late and figured it would be faster to bike it. As it is, I made a wrong turn after I got off the train, so I was late anyway. It took me an hour and a quarter for the whole trip, but that includes ten minutes lost to my navigational error. The trip takes about 25 minutes by car in average traffic. A little over double car-time seems fairly typical for public transit. On the way back, I decided to take the Tasman line to see how much difference it made. It was a 12 minute wait for a train, but even so, the trip took an hour and ten minutes, about five minutes longer than when I rode the Tasman section. Probably worthwhile. But it was on the return trip that my problems started. The bike section had three bikes in it already, so I didn't have much room to work with struggling to get my bike up, and managed to wrench my back in the process, and couldn't get past that to get the bike up where it needed to be. A nice fellow rider helped me. I rode the rest of the trip in pain. I got the bike down without too much trouble when I got to the transfer station, but when transferring to the Santa Theresa line again I couldn't lift it high enough -- it hurt too much. Again someone helped me. I sat near the bike, trying to find a position that didn't hurt so much. Every so often someone else came on with a bike, struggled with it for a while, eventually got it up, then looked at me, we exchanged sympathetic glances, and the other rider would say, "My bike is heavy" or "I used to have a lighter bike, but it got stolen". Apparently it's not just me -- lots of commuters have this problem with the VTA bike racks, because they're set up for fancy lightweight bikes and lots of people use cheap heavy bikes for commuting. I'm home safely now, with ibuprofen and a comfortable chair, wondering how long my back is going to be sore and whether I'll have the courage to try VTA again. Certainly not without a regimen of abdominal and back exercises first. Or a much lighter bike. I went to dict this afternoon to find out whether "cerebral" was best pronounced ser EE brul or SER e bral. Great! What does that mean? It's not the standard phonetic markings like dictionaries use (lucky for me, since if it used accent marks and such, I wouldn't be able to display it in my terminal font). Jutta helped me out with the investigation, and with some combined googling and README-reading, she eventually found gcide's pronunc.web file. That holds the key to the stresses: the double quote (") is a heavy stress (light light stress, not indicated, would be a backquote). The asterisk (*) is simply a hyphen to separate syllables (why they don't just use a dash, or even a space, I'm not sure). That's progress, but what do those vowels mean? And the C? (Okay, I know it's pronounced as an ess. I even knew by now that both pronunciations are acceptable, since I'd looked it up in a dead-tree dictionary and so had about four other people on the channel while I was trying to track down a dict pronunciation guide). pronunc.web talks about a long list of special characters that are supposed to correspond to web fonts (haha). But dict doesn't actually use those: try dict free, which gives the pronunciation /free/, while pronunc.web says it should show up as /fr<emac// (which, you have to admit, would be pretty confusing what with the close slash for the special character followed by the close slash for the pronunciation; even aside from the question of who can read strings like /fr<emac//, ick). Some other googling mentioned web dictionaries, including gcide, using the pronunciation guide from the Jargon file. Ironically, this was very hard to read since it uses smartquote characters all over the place which not only don't appear in the font I was using in mozilla, but also don't get substituted properly in mozilla (moz is usually pretty good about that) so I just see boxes. It's possible that the font claims to have the characters, then shows boxes instead. Jutta wondered why PRONUNC.JPG and PRONUNC.WEB weren't in the Debian package, since they're mentioned in /usr/share/doc/dict-gcide/README.dictionary.gz. I have mixed feelings: I think it's a bug that there's no file that describes the pronunciation system being used, but since neither of those files does describe it, not including them is probably not a bug. At Jutta's suggestion, I filed a bug on dict-cgide (bug 266773). The new XP Starter Edition only allows three apps to run simultaneously. Do viruses and spyware count toward your limit? "We're sorry, but you can't log in, because you've already reached your process limit." The Register had an article on the copy protection in the Beastie Boys' new CD. The relevant bit: the copy protection is only for Windows PCs (it uses a data track with an autorun file) and even then, it does nothing if autorun is disabled. For linux and mac users, it does nothing at all, and works as a normal CD. And Windows third-party CD burning apps can burn copies of the CD just fine. The CD publisher, EMI Italy, was asked about this, and said they weren't worried at all about linux and mac users, or PC users who know enough to disable autorun (or use a CD burning app? ); they think the majority of PC users will be stopped by this. Assuming that Windows users who know enough to rip a CD and then distribute it online, but not enough to google for how to disable autorun, may seem a bit weird. But I guess if that's the kind of copy protection they want, we should be happy for it. Personally I still wouldn't buy a copy protected disc (I don't buy CDs from RIAA publishers anyway, a little personal boycott) and of course there's no guarantee, knowing the RIAA's history, that they won't decide to come after linux and mac users later; but for now, I suppose we should be happy that if we accidentally happen on this sort of disc, we don't have to worry about the Windows-oriented copy protection getting in our way. Another great BBC headline: Mystery pain 'is all in the mind'. Fun review in today's Chron about a new book by the writer of the Arcata Police Blotter. I'd read about the blotter once before, in Jon Carroll, I'm fairly sure, though I can't seem to find that article. Sounds like a fun book. Turns out the Arcata Eye, complete with police blotter, is online. Cool! I spent a few minutes this morning wandering around the garden with a camera. I also learned (via google) that those huge black insects d has been calling "wood boring wasps" are really "giant carpenter bees". A wood boring wasp actually looks like a wasp, whereas these look like black bumblebees the size of a small hummingbird, and make almost the same wing noise as they pass overhead. I spent Thursday volunteering at Get SET, a program for introducing high school girls to science and technology. I helped with the Java programming workshop. This was my first time with Get SET (or any similar program), but I was impressed: it's a good program, and I want to do more work with them. The workshop went really well, better than I expected. The girls were all bright and motivated, and they all managed to complete all the programming exercises. At the end we talked about open source a little bit (I was glad I'd brought the linux laptop along). Some of the girls found out they don't have the patience needed for programming or debugging, which is fine -- not everyone is interested in wrestling with obscure compiler error messages. Others dove right in, and freelanced a little, changing "Hello world" strings to messages talking about themselves or their friends. The girls who had the most difficulty apparently struggled either due to poor typing skills, or, perhaps, poor vision. I saw a lot of girls typing colons instead of semicolons, or periods instead of commas, or 0 or O instead of (), and of course the compiler error messages didn't give a first-time programmer much clue that that was what the real error was. The only criticism I had was that it was a little too "cookbook". Mostly they were given the code, and had only to type it in. Since there were lots of exercises and everyone was working at different rates, any theory presented in front of the class was likely either ahead of or behind the exercise that any given girl was working on at the time. This is a difficult problem to solve. Having lots of small exercises, where everyone progresses at her own pace, works out really well; but not being able to explain theory means that a lot of the girls were just blindly retyping, and didn't understand things like curly braces (I saw a lot of compiler error messages caused by "import" statements inside a class, or statements outside any class method, or simple unbalanced braces). I wondered, during our postmortem after the girls left, whether it might be better, rather than having the girls complete 13 exercises then work on some extra tasks if they have time, instead having some extra tasks which they could complete at the end of each exercise, so the fast-working (or fast typing) girls would have something interesting to do while the others caught up, but everyone would still be on the same exercise and then the instructor could explain the next one to everyone all at once. This would of course require more prep work, coming up with interesting extras for each exercise. They used Codewarrior for the exercises, and it took a lot of mouse clicks to change from one source file to another, and it has to be changed in two places. A lot of girls ran into trouble there. I found myself musing on how much easier it is just to type "javac filename" and then "java filename" to run it. (I'm sure Codewarrior is fine when you have a full project already set up and you're used to the interface.) Besides, javac (either from Sun or IBM) is free and Codewarrior isn't, so if any of the girls are interested in following up, which one would be easier for them to use themselves? The last exercise actually did use javac, though, and it turned out that the software had been installed to an unexpected place, and so the pathnames in the instructions ended up not being right. I don't know what the procedure is for having software installed on lab machines at a school, nor whether there's much chance to test the setup before it gets used for the actual class. It sounds like a fairly complicated thing to coordinate. Of course I found myself thinking about whether customized knoppix CDs could be used for such a purpose (though they would probably be too slow). If I ever get to design a course like this, I might try less "printing to stdout" and introduce GUIs earlier. GUIs are harder to program, but there was so much provided code anyway that it might not hurt to just provide a framework and say "This is how you bring up a window; don't worry too much about the details" and then start introducing buttons and text fields and so on -- rather like the approach taken in the O'Reilly X and Motif books, starting with a small "hello world window" example then gradually adding things to it. I think building up a medium sized program, with a window with lots of elements in it, might be more fun for a beginning programmer than just doing one short program after another. The girls could have used some sort of help interpreting the compiler error messages, but I don't know of a good solution to how to teach this. Compiler errors tend to use fairly technical programming terms, which wouldn't have been appropriate to try to explain to someone with a few hours' programming experience. Even some of the volunteers had trouble figuring out the error messages. I wish there were a language for which this wasn't true, but python, perl, JS, all have fairly esoteric error messages which are difficult for a beginner (and sometimes even an experienced programmer!) to understand. The only clue I can think which might have helped them is a rule such as "if the compiler gives you an error you don't understand, carefully check the line with the error and a few lines for typos or incorrect punctuation marks." Perhaps followed by rule 2, "If that doesn't solve it, or especially if the error seems to have nothing to do with the line where the error is reported, check everywhere for balanced parentheses, curly braces, and square brackets." Those two would have handled at least 80% of the errors I saw. Finally, the big question: how do you make the process creative, starting with students who have never programmed before? Learning is much more fun when you have problems to solve, or if you can look at it as a friendly competition or a game. That's hard when you're trying to cover a lot of new technical material in a single day. I don't have any ideas yet, but I'm going to give it some thought. The California newts are still in their normal pond at Montebello. The pond is drying up, though (the area between the two ponds is dry now). We even saw a pair that might have been mating. It'll be interesting to see how long they stay there before they migrate. One of the other ponds had a few tadpoles, one with legs sprouting. Okay, that subject line isn't likely to surprise any veteran linux user. But here's the deal: wvdialconf in the past didn't support winmodems (it checked the four /dev/ttyN ports, but not /dev/modem or /dev/ttyHSF0 or anything like that) so in order to get it working on a laptop, you had to hand-edit the modem information in the file, or copy from another machine (if you have a machine with a real modem) and then edit that. Whereas kppp can use /dev/modem, and it's relatively easy to add new phone numbers. So I've been using kppp on the laptop (which has a winmodem, alas) for years. But with the SBC switch to Yahoo, I haven't been able to dial up. "Access denied" and "Failed to authenticate ourselves to peer" right after it sends the username and password, with PAP or PAP/CHAP (with CHAP only, it fails earlier with a different error). Just recently I discovered that wvdial now does check /dev/modem, and works fine on winmodems (assuming of course a driver is present). I tried it on sbc -- and it works. I'm still not entirely sure what's wrong with kppp. Perhaps SBC isn't actually using PAP, but their own script, and wvdial's intelligent "Try to guess how to log in" code is figuring it out (it's pretty simple, looking at the transcript in the log). I could probably use the transcript to make a login script that would work with kppp. But why bother? wvdial handles it excellently, and doesn't flood stdout with hundreds of lines of complaints about missing icons like kppp does. "Solar System could be 'unique'"
In the past 10 years, over 100 extrasolar systems (planetary systems orbiting stars other than the Sun) have been discovered from the wobble in their host stars, caused by the motion of the planets themselves. But none of them seem to resemble our Solar System very much. In fact, these exoplanets have several important attributes that are entirely at odds with the Solar System as we know it. Planetary size is one puzzle; most exoplanets are gargantuan, gaseous masses like Jupiter. Smaller planets similar to the Earth's relatively humble proportions - and rocky composition - are noticeably absent, although the researchers admit that this may be because smaller planets are more difficult to spot. Also, the large exoplanets are significantly closer to their stars than those in our own system are to the Sun. Well, duh. We're detecting planets by their gravitational influence on their star, and, what a shock, most of the planets we've detected that way have been massive and close. What a shock! I guess there must not be any small planets out there, huh? The New Scientist article is a bit better written, and mentions that the exoplanets' highly elliptical orbits relates to the theory of how that particular system evolved. So I'm guessing that's what the real article is about: that the eccentricity we're seeing in these big super-Jupiters' orbits is really the basis for the paper, and not the fact that, duh, they're large. It's probably a perfectly worthwhile paper that's just being butchered by the accounts in the popular press. Strangely, the publication where it supposedly appeared, the Monthly Notices of the Royal Astronomical Society, does not seem to list this article or anything similar to it in either of the August issues so far. Someone asked how this compared to SVG. The answer was to think of Canvas as an image you can change from JS -- simpler than an SVG document. Brendan was funny, playing Vanna as Shaver did the brunt of the talking. "Ooh, that's pretty. What's that?" Roc then gave a talk on "New Rendering Features for Gecko". Probably what attracted the most interest there was transparency: he has a new hack (not yet checked in) where you can add a parameter to a XUL window to make it transparent. X only supports 1-bit transparency, but in Windows implementation XUL windows can be fully transparent. He began his talk talking about Cairo and about the changed hardware expectations these days. He stated that everyone has 3D now, or at least, anyone who doesn't, doesn't care about rendering and doesn't expect much. I found that rather disturbing, given that I sure don't want to see rendering stop working well on my laptop, and I'd hate to see Mozilla ignore education, developing countries and other markets where open source on cheap hardware is starting to gain a strong foothold. The other bothersome thing Roc talked about was high-res displays. He mentioned people at IBM and other places using 200dpi displays, which (as anyone who's used even 100dpi and has imperfect vision knows) leads to tiny text and other display problems on a lot of pages due to the ubiquity of page designers who use pixel-based sizing. Roc's answer to this was to have an automatic x2 or x3 zoom for people at high resolutions like 200dpi. This seems to me a very poor solution: text will either be too big or too small, and images will be scaled weirdly. Perhaps if it's implemented as a smart font size scaling, without any mandatory image scaling, it could be helpful. I wish more work were going into Mozilla's text scaling, rather than things like automatic 2x zooms. Maybe this will be part of the work. Guess I need to seek out the bugs and get involved before I worry too much about right or wrong solutions. Then AaronL gave his accessibility talk, stressing that "accessibility helps everybody" and that the minimum everyone should do is check pages and new XUL objects for keyboard accessibility. He talked a bit about how screen reading software works, with a demo, color-blindness issues (don't ever use color as the only cue), and accessibility problems with the current fad of implementing fake menus using JS and DHTML (such menus are almost never accessible to screen reading software, and often can't be triggered with keyboard events either). Hopefully awareness of these issues will increase as legislation mandates better accessibility. Aaron's talk was unfortunately cut short because he was scheduled as the last talk before lunch; people seemed interested and there was a lot of information on his slides which got skipped due to time constraints. After lunch, Nigel spoke on writing XUL applications, Bob Clary presented an automated site testing tool he'd written (which runs in Mozilla) to validate HTML, CSS and JS, roc spoke again on the question of how backwards compatible and quirk-compatible Mozilla should be, Myk presented his RSS reading addition to Thunderbird mail, Pav gave a longer demo of the Cairo Canvas, and several other demos were presented. The SF Chronicle this morning had a little note headlined, "HP first to introduce Linux-based laptop". Aside from the obvious error in "first" (the article itself admits that several smaller manufacturers have been selling linux laptops for quite some time), I wondered if this was real, or just another of HP's attempts to get credit for supporting Linux without actually risking Microsoft's wrath by selling any product. So I went to HP's web site. No mention on the top level, so I tried searching for "linux laptop" and got nothing useful. So I did some clicking around to find the particular model mentioned in the article (nx5000) and eventually found it (under business systems). That listing did indeed list SuSE as an OS option. But clicking through to buy or customize the machine took me to screens where Windows XP was the only option, and the lowest price was the Windows price (the Linux price is supposed to be $60 lower). Later, it occurred to me that HP calls them "notebooks" rather than "laptops", so I went back and searched for "linux notebook". This gave several false hits, including a page on "Linux solutions from HP" with a link to "Products", which eventually leads me to a page where they're apparently offering drivers, but no hardware. An excellent example of Jakob Nielsen's Alertbox topic this week, "Deceivingly Strong Information Scent Costs Sales". The search also led me to a press release which was obviously the basis for the Chron article, and a generic "Business Products" page that looks like one I probably already went through in my search earlier today that led to screens offering only Windows XP. I very much hope HP proves me wrong this time, and updates its sales pages to offer the OS option its press release is claiming. Someone sent me mail asking about my CD label page, and that inspired me to fire up gLabels for the first time in a while. Debian has 1.93.3 (on sarge, anyway) and it's looking very nice! There's now a separate pane for object properties, which I'm not entirely crazy about (takes up a lot of screen space relative to using a dialog) but the most important thing is that the label outlines now draw even if covered by an image. That means that you can reasonably line up a CD label image with the template now, which makes my old patch to gimp-print much less needed. The gimp-print patch might not be needed at all, if libgnomeprint could print with high quality. I wonder if that's coming? I haven't actually tried printing to see what the quality is like now. I should probably snarf the latest gimp-print and update my patch anyway.